For adults, add 3 grams (3 measured spoons) into warm water as tea. 2-3 times a day or as directed by health practitioner. One bottle contains 100 grams of herbal formula. If taken as directed, the contents should last around two weeks. In general, you should feel results in approximately two weeks. The effectiveness of the herbs on your system will depend on your physical condition at the outset of ingestion. 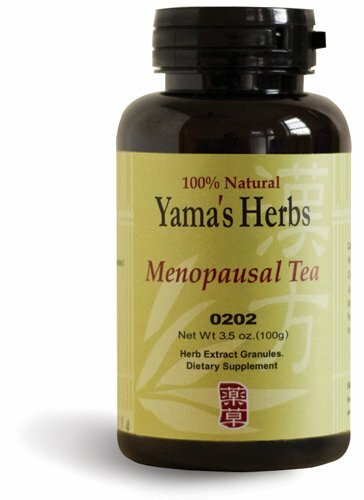 Dealing with menopause just got a little easier. Our herbal tea will help. 100% NATURAL and we use over 400 kinds of certified organic herbs, all packaged in the USA. Yama's herbal formulae are FREE FROM SIDE EFFECTS associated with synthetic drugs. Founder Yamaguchi O.M.D., L.Ac has over 33 YEARS of clinical expertise in Chinese & Kampo medicines. If you have any questions about this product by Yama's Herbs, contact us by completing and submitting the form below. If you are looking for a specif part number, please include it with your message. Yamcon Natural Bioidentical Progesterone Cream Extra Strength 10% 2 Oz.